The heat transfer coefficient α is a calculated figure we can use to see indirect what is happening inside a heat exchanger. In an idle world, the internal surface of a heat exchanger stays clean during its operation. If this is the case the heat transfer will constant as well, all good. See the picture to the left. After installing Merus the tubes are clean, where is constant flow. Such clean tubes, or with a very thin layer of incrustation the heat transfer is very good. As we are in most case not in an idle world, there happens fouling in heat exchangers. Means one can find all kind of incrustions. These incrustation are acting as an insulation. Less heat is transferred. We at Merus use the heat transfer to monitor the efficency of the Merus Rings. 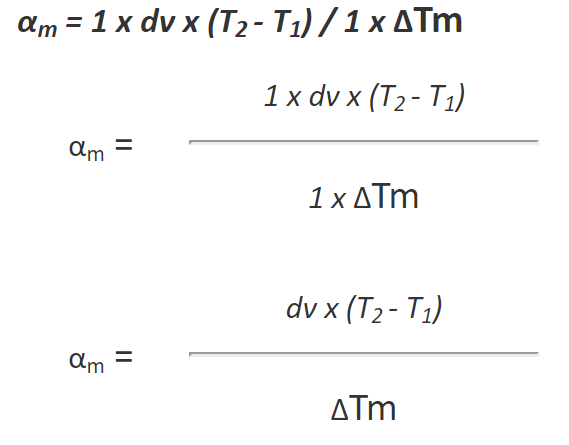 For the control (development of heat transfer coefficient) are no absolute values required, so it is possible to set A as constant (=1), and assuming always the same liquid cp and hence the same density ρ and set both as well as constant(=1). As the mass flow may be calculated with dm = dv x ρ (volume flow times density) we will get the "qualitative" Heat transfer coefficient αm . Using: T2, T1 the inlet and outlet temperature of the fluids and the volume flow. The heat loss is also taken as constant. If you will need help, how to do the calculation or how to analyse / interpret your results from the field, please dont hesitate and write us an Email. People are asking about the coefficient of water, or about the heat transfer of copper or steel. There is not such a thing, as the heat transfer is not depending only one material. It is a process value of the heat transfer in between a fluid and a body. For example from cooling water to the steel of a heat exchanger. The heat transfer coefficient depends only on the fluid, its movement and the surface of the solid body. However, not from the material of the solid body. Assumed we have tubes in water (e.g. 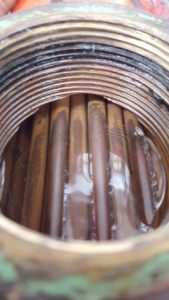 tube bundles in a tubular heat exchanger). If the water stays still, the possible heat transfer is 350 to 500 W/(m2K), in case the water is running the possible heat transfer is 350 to 2100 W/(m2K). Having the same setup of the hardware and surroundings and change only the velocity of the water, one is able to transfer 4 times more energy. Guide values according to tables (Fig. VIII-5) [Kuchling]. People also calculate the U-value, which refers to the overall heat transfer coefficient. This is a more prinicpal value, and give at the heat exchanger design an indication how suitable certain materials are for constructing a heat transfer area. So it can be understood how important it is to have clean surfaces. As dirt, limescale, rust or biomass all are lowering the heat transfer in a negative way.